Plane travel with a toddler. If the thought sends you into an anxiety attack, I can’t say I blame you! I actually overheard a mom in the family boarding line say ‘Everyone is scared to travel with a baby… but a toddler is way harder! They’re wiggly!’ Truer words have never been spoken! I flew with Hunter when he was 6 months old, by myself, and actually had a pretty easy time of it. (Please DON’T hate me if you have a horrible baby travel story!) When your little munchkin can’t walk, and is still being bottle or breastfed, there’s just less to worry about from a logistics point of view. So, when the time came to plan for a family trip this summer… I was a little nervous. How do you pack for a successful plane trip with a tiny, wiggly ball of energy? Well, let me tell you, I’ve done the leg work and I’m here to share! 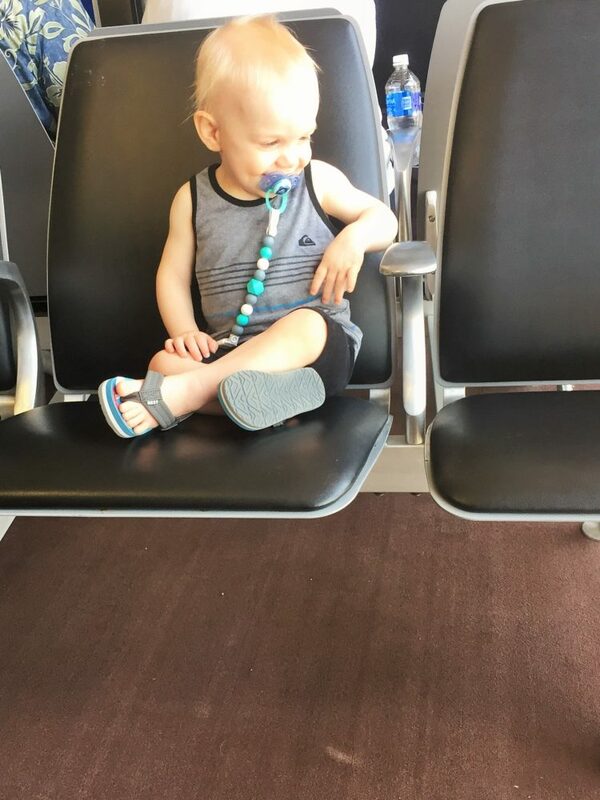 Hunter is a year and a half (20 months if you’re into that way of thinking) and therefore can fly without us purchasing his own seat. For this trip, since my husband and I were both flying, we decided to take advantage of the under 2 rule and have Hunter fly for free. He would have 2 parent laps to sit or lay on and together we could successfully keep him contained to our personal space. If this were a one parent flight, we likely would have purchased the extra seat and brought along his car seat for everyone’s sanity. Hunter is a mostly happy kid, I wouldn’t call him difficult by any means. But all kids have their moments! And when you’re away from home and putting your child in a new situation, it’s always a good idea to be over-prepared. With that in mind, here are my must haves for the travel diaper bag. 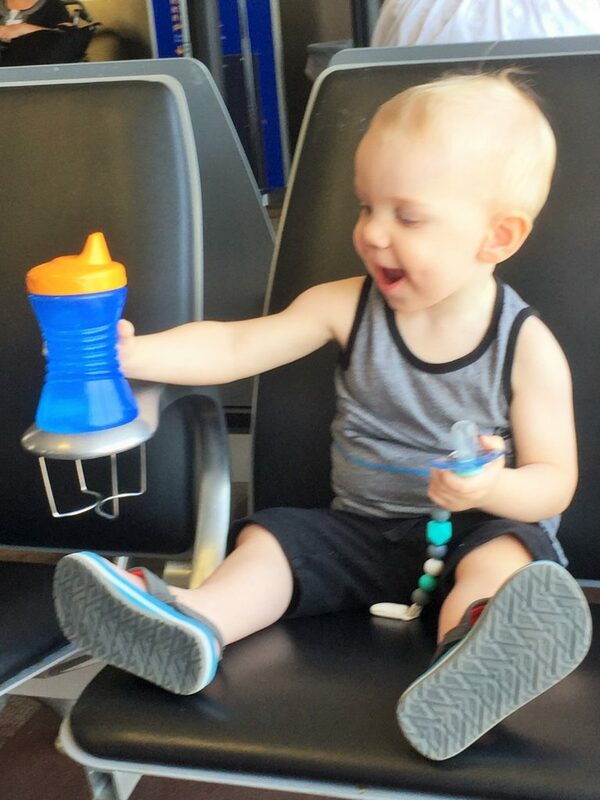 Must Have 1: Snacks and sippy cup. In our house, there is almost nothing that can’t be fixed with a snack. 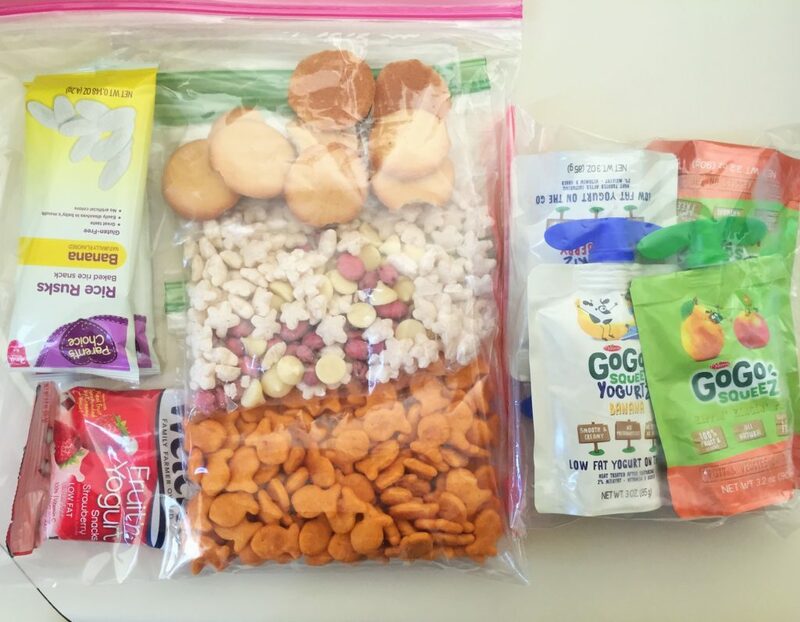 To get ready for the trip, I packed a gallon size zip top bag with a variety of dry snacks. I packed a separate quart size bag with applesauce and yogurt pouches. These CAN be packed in your carry on (we like the GoGo Squeez pouches, each is 3 oz), but you do need to have them in a separate bag to pull out at security since they technically qualify as liquids. Pack these bags at the top of the diaper bag for easy access! Must Have 2: Comfort item(s). If your child uses a pacifier, or has a special lovey/blanket/small stuffed animal, I would definitely recommend bringing it for the flight. 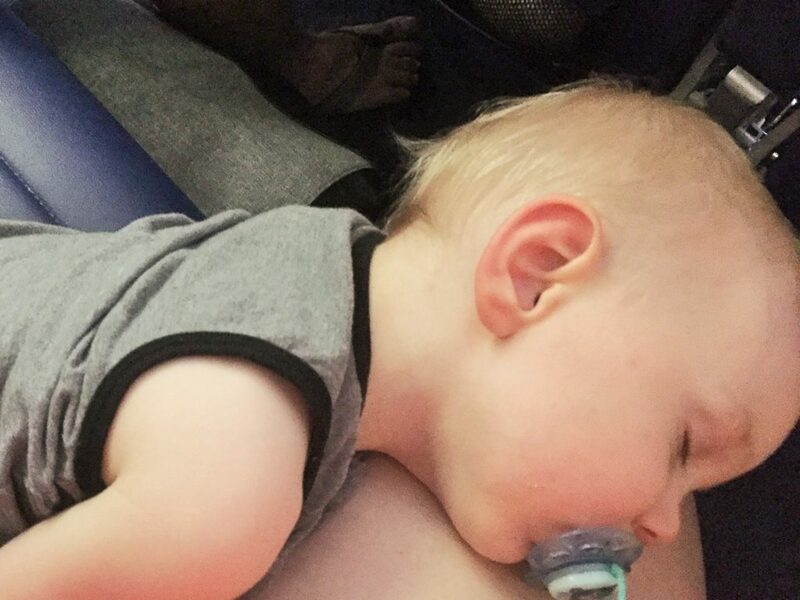 I know many parents only allow these items at bedtime, but if there was ever a time to make an exception and help your child to feel at ease and secure… a plane ride is it! It may even help to encourage an in-flight nap if you’re super lucky. Must Have 3: iPad (with headphones) loaded with favorite show. This was a ‘just in case’ option. We didn’t end up needing the iPad on the way there, Hunter slept for the whole flight. But, during the flight home we were glad to have the option! We purchased some cheap over ear headphones because we weren’t sure if Hunter would be interested in wearing them. I’m glad we didn’t spend more because he didn’t end up using them. We kept the volume down and he just watched the screen for a bit. We did practice with the headphones ahead of time, and if your child isn’t used to them I would recommend doing the same. To practice, we turned on a show and my husband and I each put the headphones on. We also put them up to his ear so he could tell that there was noise coming out. In the end, he just wasn’t interested enough to put up with having something covering his ears. Better luck to you! For our trip, I found a couple of great travel toy options. 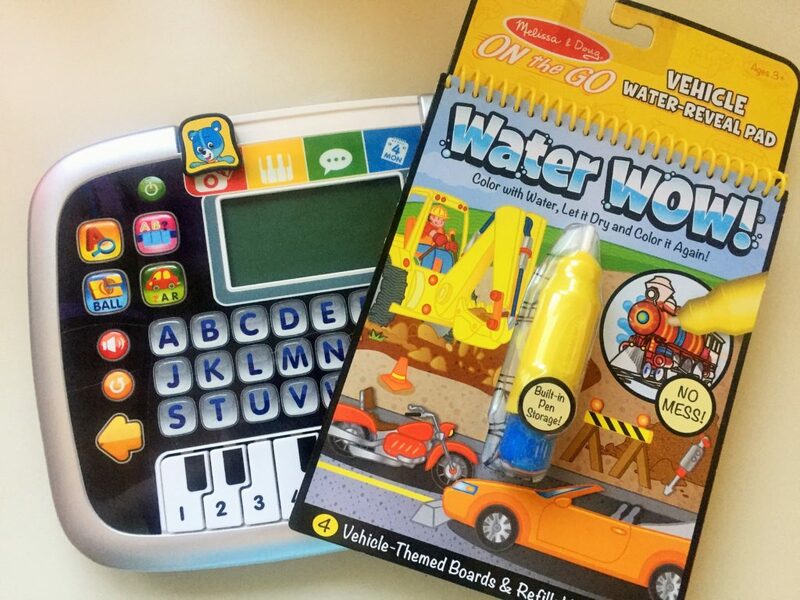 First, these Melissa & Doug Water Wow pads that come with a water pen are fun for littles and mess-free. All you need to do is pour a little water into the tube of the water pen and let your toddler take over. They also dry back to white so your kids can use them over and over again. I bought a 2 pack so he had a different one to use for each leg of the trip. We also found a little Vtech tablet for Hunter. He was a little young to know what was going on with it, but pushing buttons and watching things light up and move entertained him pretty well. Small toys or toys with small parts will likely end up on the floor of the plane at some point. I chose items that were a little larger so that they’d be easy to spot, and weren’t likely to slip through cracks or roll down the aisle if they fell. New toys or activities tend to work better for holding a child’s attention. Something they’ve never seen before will be exciting to them. Even a couple of well-chosen items from the dollar store would probably do the trick. If you’d rather not spend the money, stash away a toy that your child likes a week or two in advance. Then, when the child sees the items on travel day.. they will be excited to play with them all over again. If the toy makes noise, check to see if there are volume settings. With the white noise of the plane, a lower volume setting probably won’t irritate other passengers. These little items aren’t so much for keeping your toddler entertained, they’re more for your own piece of mind. You may already have these in your diaper bag, but if you don’t I would totally throw them in for your travel adventures! Antibacterial wipes. Planes are just dirty, and wiping down the surfaces immediately around us made me feel a little bit better. Kids have a way of putting their hands (or mouths) on the germiest things…This made things a little less cringe-worthy. Empty plastic bags. Preferably ones that are zip top or that can be easily tied. If you have to dispose of a dirty diaper, containing the smell is just the right thing to do if possible! You can also use these for dirty clothes if your child has a blow out, spits up, etc. Extra baby wipes. All moms know, cleaning tiny bums isn’t the only use…. wipe up hands, faces, minor spills, the list is endless! Hope you found my little list of must-haves to be useful! We had an excellent trip, and feeling prepared started things off on the right foot. Hunter slept the whole time on the first flight and we ended up with an extra seat between my husband and I (score!) so it was a wonderful experience. The return flight wasn’t quite as smooth. No extra middle seat (but nobody gets that lucky twice in one week!) and Hunter stayed awake, but we were able to keep him mostly happy and entertained with all of our smart packing! What are some tips you use when traveling with little ones?? YES!! Traveling with a toddler is so much more work that with a baby!! Great list, I totally agree! 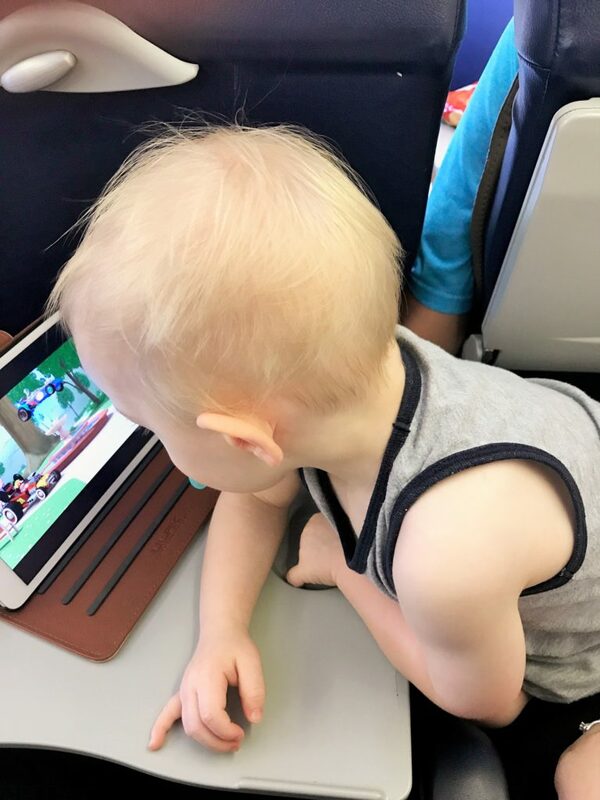 I have flown with my toddler quite a bit and I can attest that you need everything on this list! I love the way that you prepared your snacks, super easy and less mess! Thank you for sharing. Thanks, Chevelle! The key to keeping my little guy happy with snacks is lots of options… felt like I packed one of everything in my pantry! Such a great list – love those headphones. 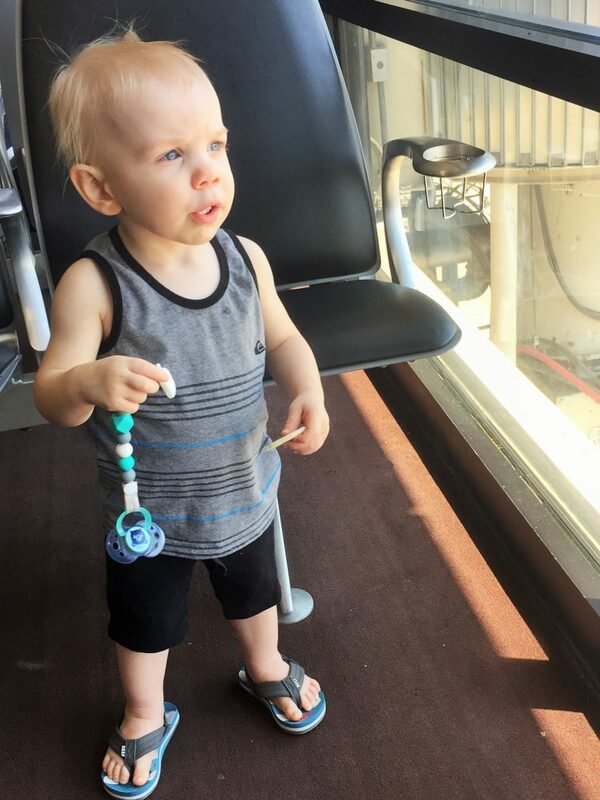 I also traveled with my son on the plane for the first time alone too and it went so well! Thanks, Nicole! Glad you had a good experience, too! But even when it goes perfectly, it’s still nerve-racking for us mamas… Always trying to anticipate what MIGHT go wrong! 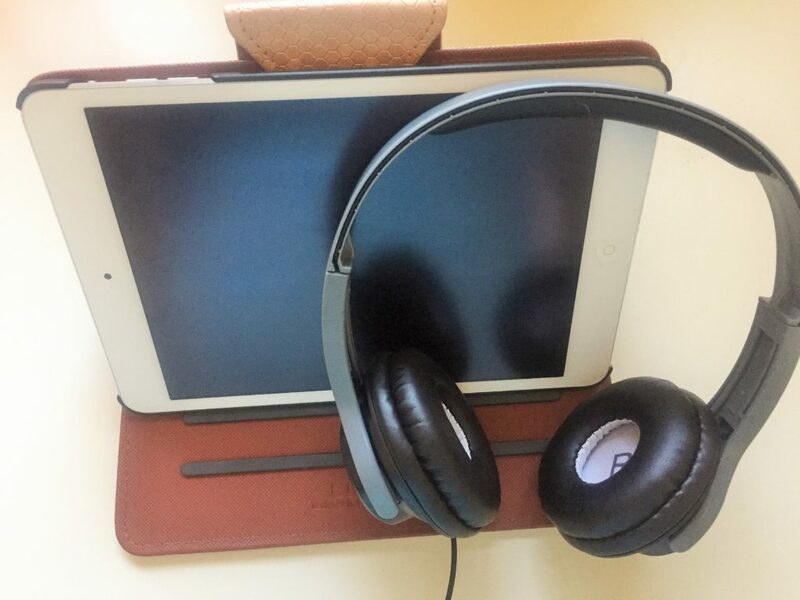 Bringing an ipad and headphones was a game changer when flying with my kids. Agreed, Tamara! I thought Hunter might be too young, but it was so great to have! Great list! We’ve flown with our daughter several times and it was by far easier when she was a baby! Now that she’s a toddler all that she wants is snacks and the iPad. Thanks, Kerry! I remember when I flew with Hunter as a baby… wow! I don’t know what the big fuss is! HA! Now that he’s a toddler, I know! I am always in awe at people who can travel with toddlers! Amazing – I can barely travel alone! Thanks, Divya! Sometimes I can barely travel alone, too! 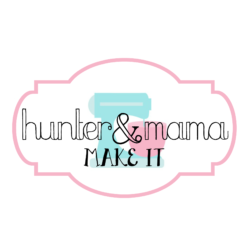 And I’m still in awe of other mamas I saw on our flight traveling with multiple kids! Thanks, Emily! Keeping a toddler happy is work no matter what the circumstance! But no toys! I’d have sent him right back to the house!!!!!! Perfect list. We used the same tactics and had four successful flights! Some of our favorite things to bring along were books, and we preloaded my tablet with pictures of everyone we know which really came in handy when he was getting really upset — we use electronics or tv very rarely so a few minutes on the plane wasn’t the end of the world for us and looking at pictures to identify people helps memory and language skills! Thanks Rachael! And I’m totally stealing your picture idea for next time. I never thought of that… but Hunter loves looking at pictures around the house, so I’m sure that would be great for him!